2025 French zone - very nice and cultivated mint never hinged collection on Lindner hingeless preprinted pages, in the number of a major listing complete with all issued stamps including the good postage stamps sets, red cross sets, Freiburg souvenir sheet pair, red cross souvenir sheets and so on. The Constance stamp from Baden is in of the rare type II available. Wonderful quality object! 2027 ⊙ French zone - superb used collection, in the number of a major listing complete with all issued stamps and souvenir sheets on Lindner preprinted pages including the good postage stamps sets, red cross sets, Freiburg souvenir sheet pair, red cross souvenir sheets and so on, all still not expertized, therefore stamp without guarantee. Favorable opportunity! Michel approximate 8900,- €. 2058 /⊙/ French zone - extensive inventory in two large stock books, as well numerous postal stamps, often multiple, with also blocks of four and multiples. Besides Baden Freiburg-souvenir sheet cut with plate flaw V in perfect condition mint never hinged (Michel 300,- €) and so on. 2071 /⊙/ French zone - interesting and extensive inventory in four Lindner ring binder accommodated with lots of material on stock pages respectively pages with mounts. 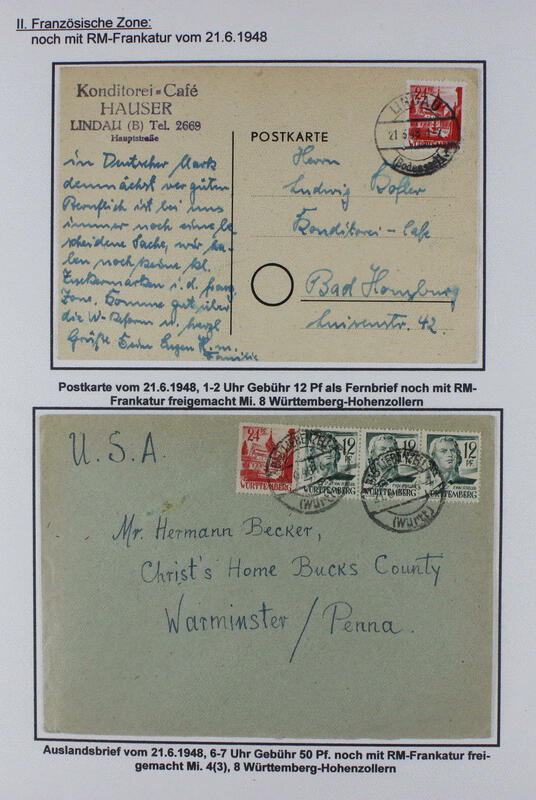 As well an extensive part generally issue including gutters, Baden with a lot of material, numerous postal stamps, also the 3. Postage stamps set, Freiburg set three times, Rhineland-Palatinate with a great many postage stamps values, also the 3. 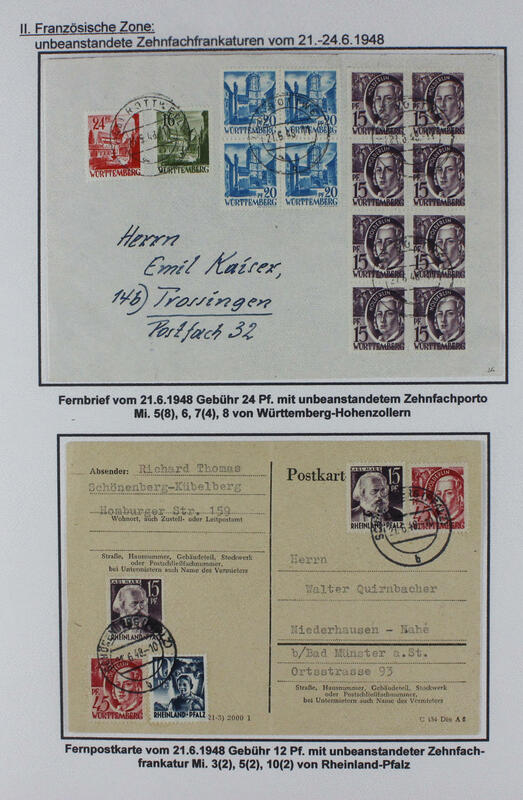 Postal stamps issue, red cross set, as well Wuerttemberg with a very extensive part postal stamps including the 3. Postal stamps issue, partly multiple available. Interesting inventory! 2117 ⊙ French zone - nice and extensive used collection on KABE pages. As well better issues, many complete sets and so on. 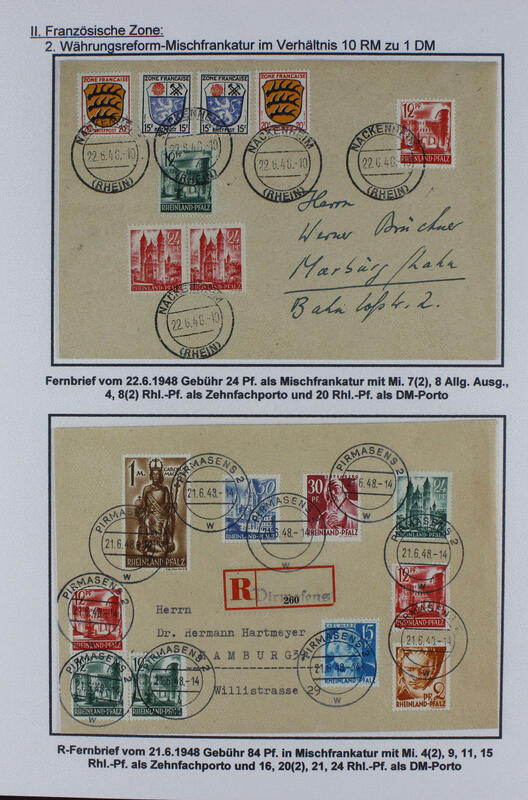 Including Baden Freiburg set, Goethe set, Schurz, Rhineland-Palatinate red cross set, Goethe set, Wuerttemberg 3. Postage stamps set and so on. Favorable! 2121 ⊙ French zone - neat cancelled collection with numerous different issues in the spring back binder on lighthouse hingeless preprinted pages, stamp without guarantee, as well better issues, including generally issue, Baden 3. Postage stamps set, Freiburg set, Freiburg souvenir sheet pair expertized Schlegel BPP, Goethe set, Schurz, Rhineland Palatinate Goethe set, auxiliary work Ludwigshafen, Wuerttemberg 3. Postal stamps issue, Goethe set and so on. Favorable valued! 2211 French zone - clean mint never hinged collection, in the number of a major listing complete on Lindner hingeless preprinted pages including all postal stamps, red cross sets, Freiburg souvenir sheet pair, red cross souvenir sheets and so on. A very nice object! 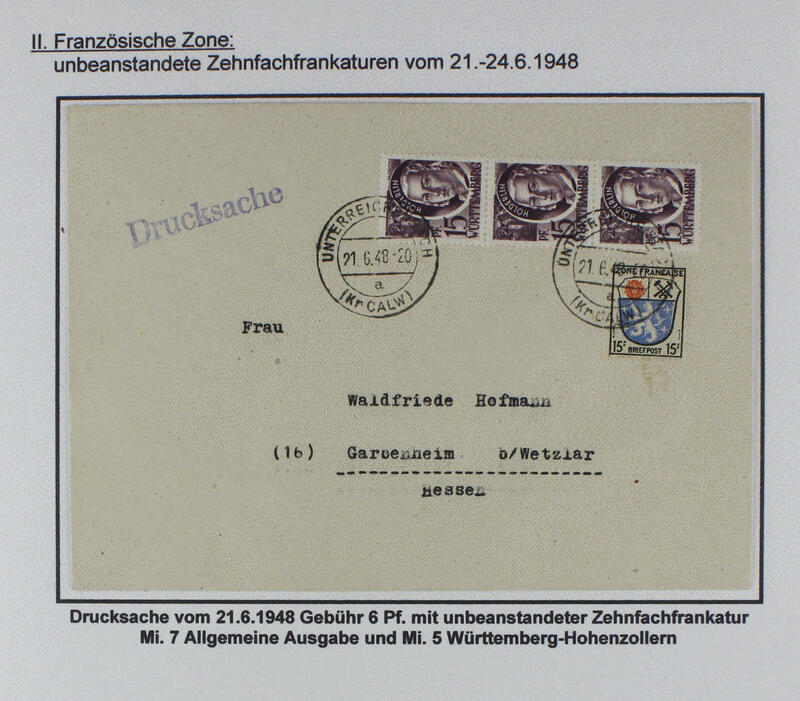 2224 / French zone - nice collection, all mainly mint never hinged formed and in the number of a major listing complete including all postal stamps, red cross sets, Freiburg souvenir sheet pair, all red cross souvenir sheets and so on. Very favorable! 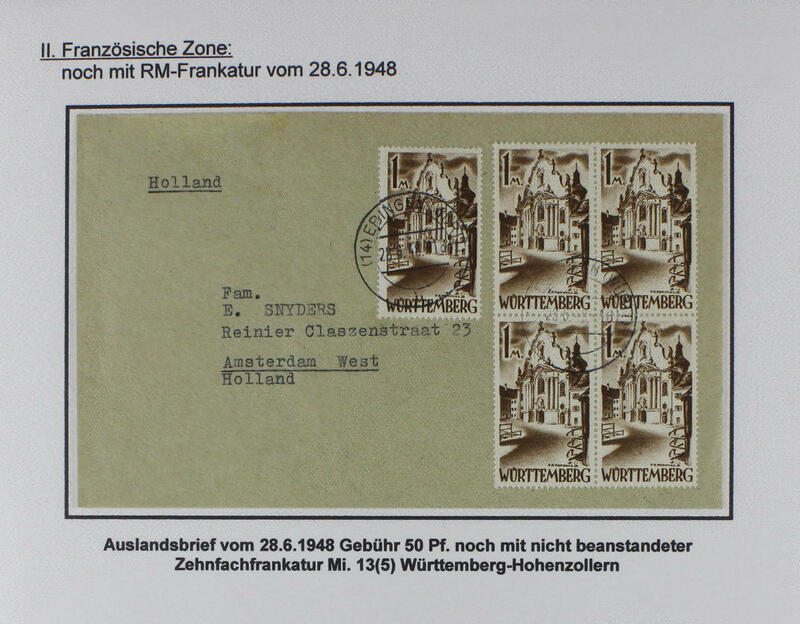 2269 French zone - very nice mint never hinged collection, in the number of a major listing complete on Lindner T hingeless preprinted pages with all postal stamps, red cross sets, Freiburg souvenir sheet pair, red cross souvenir sheets and so on. A maintained object! 2279 ✉ French zone / currency reform - very nice exhibition special collection \"the currency reform 1948\" clean mounted on pages with inscription mounted. As well extraordinary documents, scarce frankings, interesting franking combinations, multiple franking and so on. The using up as tenfold frankings was in of the French zone not really allows, was however partial tolerated. The tenfold frankings this issues are rare and covers hereof become rare offered. These extraordinary collection includes 18 tenfold frankings, from which two from the post office clerk objects to were. In this richness almost never offered! 2314 /⊙/ French zone - extensive lot in a large stockbook as well on further stock pages with lots of material, as well Baden red cross set, 3. 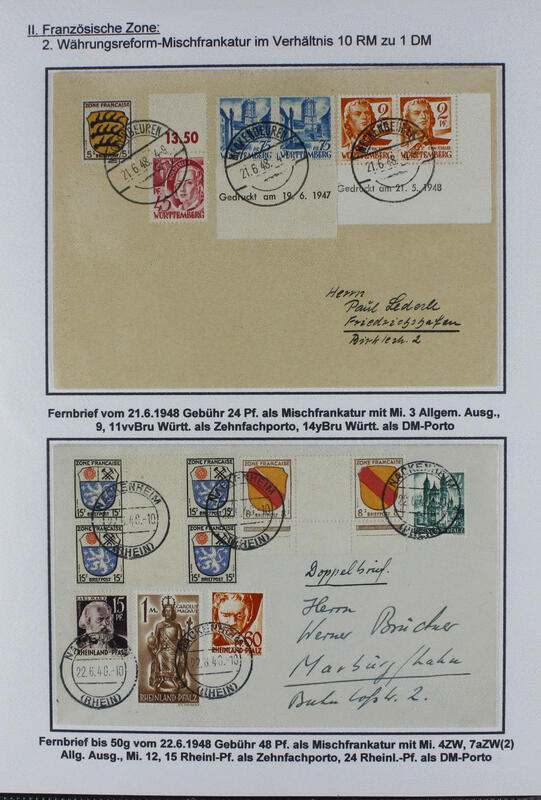 Postage stamps set, Freiburg souvenir sheet pair, Rhineland-Palatinate 3. Postage stamps set, red cross set and much further material. Favorable! 2342 x French zone - interesting lot packed in a carton with issues mounted on pages, stock cards and in bags. As well better issues, red cross sets, red cross souvenir sheets, Freiburg souvenir sheet pair, much used material and so on. Treasure trove! 2351 ⊙ French zone - nice used collection on lighthouse hingeless preprinted pages, in the number of a major listing complete, still not expertized, therefore stamp without guarantee. 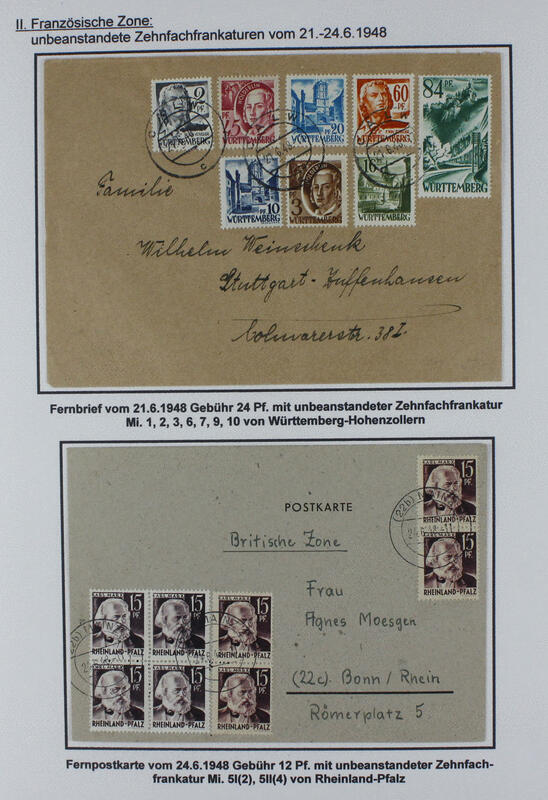 Included are all postage stamp issues, special- and commemorative sets including the red cross sets, Freiburg souvenir sheet pair, all red cross souvenir sheets and so on. Michel approximate 8900,- €. 2431 French zone - clean mint never hinged collection, complete with all issued stamps on lighthouse hingeless preprinted pages. 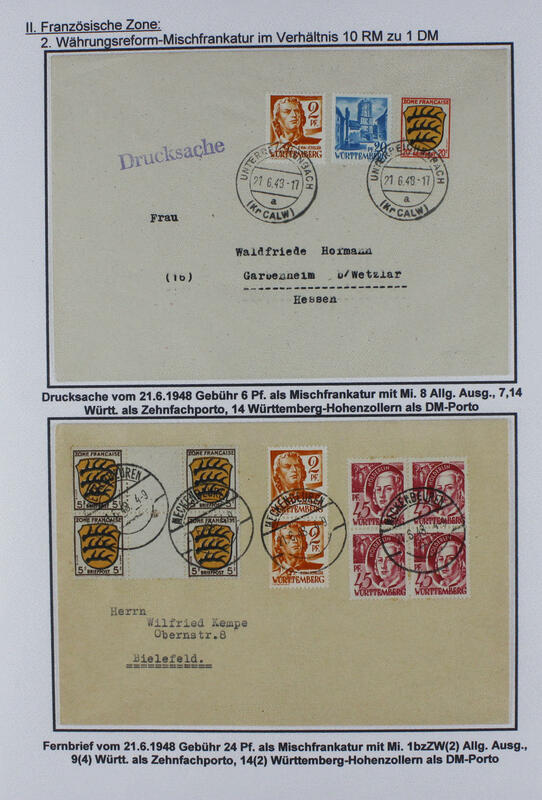 With also all postage stamps sets, red cross sets, Freiburg souvenir sheet pair, red cross souvenir sheets also the scarce Constance II. A maintained quality object! 2480 French zone - cultivated mint never hinged collection, in the number of a major listing complete on lighthouse hingeless preprinted pages including the 3. Postage stamps sets, red cross sets, Freiburg souvenir sheet pair, red cross souvenir sheets and so on. A very nice object! 2532 French zone - nice mint never hinged collection, in the number of a major listing complete including the Constance II on hingeless preprinted pages with all good issues, postage stamps sets, red cross sets, all souvenir sheets and so on. Additional as well the Constance I on nice special card with appropriate special cancel. Magnificent object! 2599 French zone - nice mint never hinged collection, complete with all issued stamps on lighthouse hingeless preprinted pages. Also the scarce Constance II, all postage stamps sets, red cross sets, all souvenir sheets and so on. A maintained object! 2669 French zone - nice and extensive mint never hinged collection, nearly complete in the Lindner T hingeless printed form ring binder. As well Baden with red cross set, Freiburg souvenir sheet pair, red cross souvenir sheet, Rhineland-Palatinate red cross set in blocks of four, red cross souvenir sheet in both types, Wuerttemberg 3. Postage stamps set, red cross souvenir sheet and so on. Very nice object! 2671 ⊙ French zone - extensive used collection in a large stockbook with useful issues, stamp without guarantee, as well Baden third postage stamps set (40 Pfg. 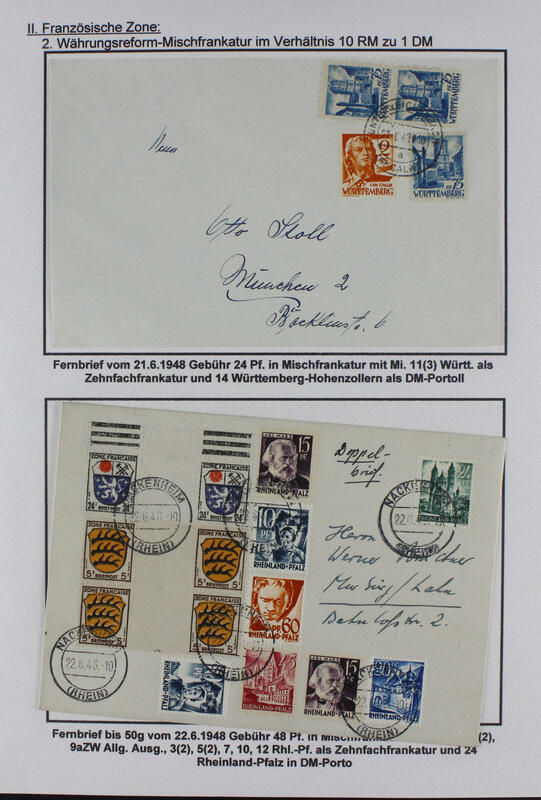 Expertized Schlegel BPP), Freiburg set, Freiburg souvenir sheet pair, Constance I, Goethe set, Schurz, Rhineland-Palatinate third postage stamps issue, Wuerttemberg third postage stamps set (80 Pfg. And 90 Pfg. Expertized Schlegel BPP), Goethe set and so on. Favorable! 2702 French zone - clean mint never hinged lot on stock cards with sought-after issues. 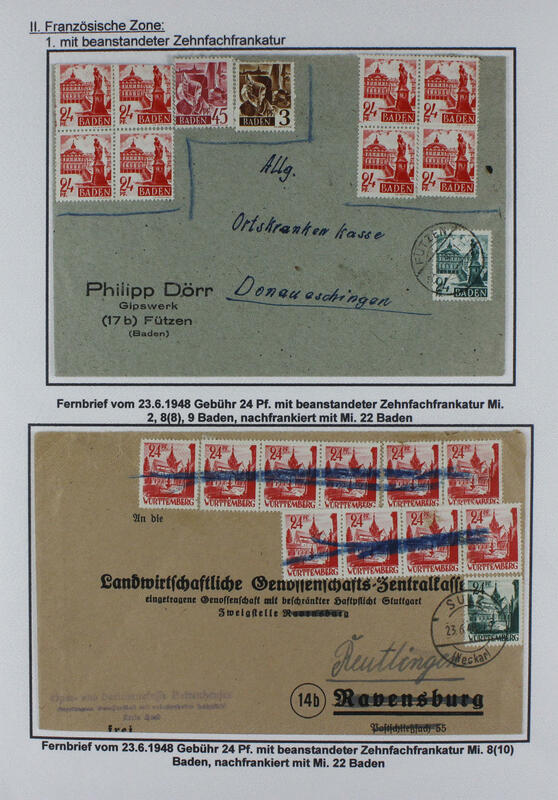 As well Baden Freiburg souvenir sheet pair, Rhineland-Palatinate red cross souvenir sheet, red cross set, Wuerttemberg 3. 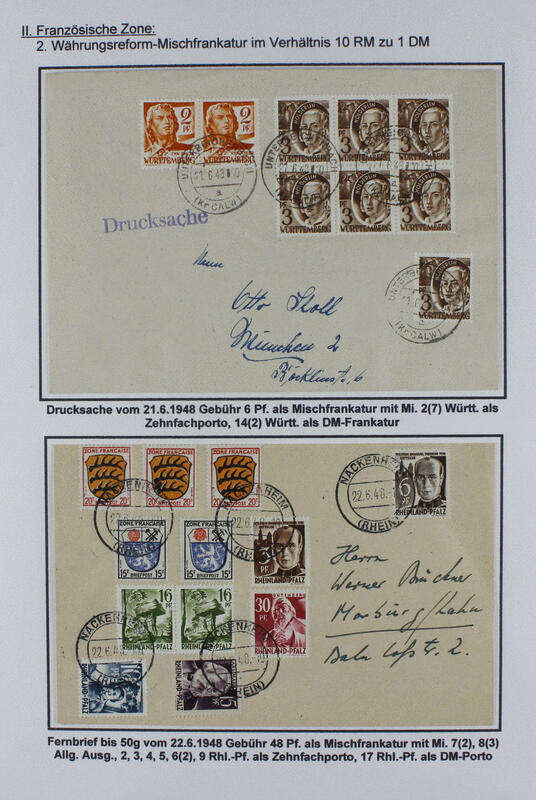 Postage stamps set, red cross set twice, numerous Goethe sets of all three areas and so on. Michel approximate 2700,- €.